Hey Everyone! I hope you are all well. Today I thought I would talk to you about a brand new series I'm going to be bringing to 'FleurDanielle'. This will be the 'Six Favorites' series. Yes I know it's not the brilliant of names and probably not the exciting of series but I want to start bring newer and fresher and more interesting content to my blog. Whether that's talking about people I'm loving within the world of cyber space, music I'm loving, restaurants I've been to, tv shows I've watched I will just be talking to you all about things I've been loving and it will be a different category each and every month. 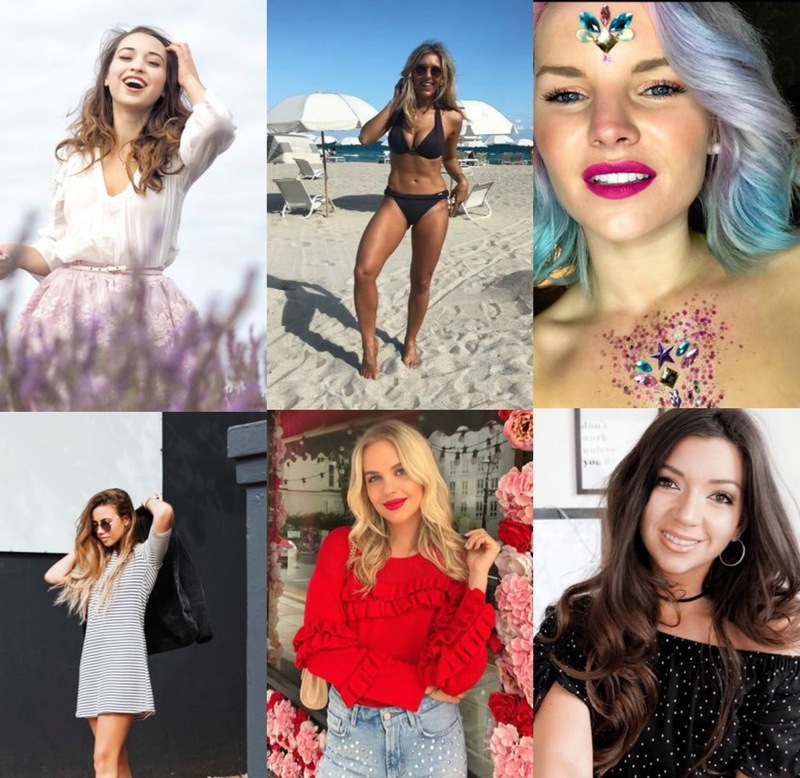 Today I thought it would be appropriate to start off with talking to you about six beautiful bloggers that I am currently loving. I hope you enjoy this post. Jordan is someone I've followed on social media for a very long time however only started to properly read her blog in the last couple of months and my god I absolutely love her. Not only is she absolutely gorgeous and reminds me of a porcelin doll, but she has an absolutely incredible writing style. Every time I read her blog I instantly feel so relaxed and she just has a way of making you feel like you're right there with her and I absolutely love that. She also happens to be one of the lovelies girls ever so if you're looking for a new blog to follow I'd definitely recommend Jordan's. Em is a blogger I've followed since I started blogging myself and there are no words to describe how much I adore her and her blog. She is absolutely gorgeous and has a figure to die for. Her blog is so incredibly diverse. There really is something on there for everyone from finding out what new beauty products are out there to looking for a new place to travel to, to even just finding out about Em herself or finding a new fitness routine! She is also one of the loveliest, kindest, most supportive, down to earth, genuine bloggers out there and I highly recommend following her. She's a blogger that inspires me every single day. Like with Jordan, Charlotte is another blogger who I have followed on social media for a while now. I stumbled across her blog purely because she posted an incredible positive speech on instastories and I messaged her straight away because it was something I really needed to hear/see at the time. I've been following her blog ever since and I just love how happy and bubbly she is. Her blog is amazing and is full of color and quirky posts and I just love that about her blog. Her fashion sense is also amazing. Jess is a blogger I've followed since for around 2 maybe 3 years now. I absolutely adore her and her blog. I think she's such a sweet lovely girl. She is so incredibly talented and since she's left university her content has just got better and better. I've loved following her adventures around South Africa and different parts of the world as she travels with her boyfriend. I think this is so interesting and as I am a travel enthusiast as well her blog and instagram are just ideal for me. I have messaged her a couple of times on instagram asking about her adventures and she's always been so lovely. I highly recommend following her. Elle is a blogger I've once again always followed but this year have constantly watched her blog/youtube and instagram. Her blog is just amazing and I absolutely love reading it. I find that when you read her posts it's just like talking to a friend. She's so cool and quirky and her photos are always amazing too and make you feel like you are really there with her. She's so gorgeous, has the most amazing pair of legs I have ever seen..like seriously leg goals right there, and her photos are always so vibrant and full of color too. If you don't follow Elle you're seriously missing out. Corrie is a blogger that I have followed since I first started blogging over 4 years ago and I've seen her blog go from strength to strength and I love the confidence that she has gained too. Her content is always incredible ranging from beauty reviews to nostalgic 'what we did in the 90s' posts which are personal favorites of mine. She has such a funny witty writing style and I know that even if I'm in the worst mood reading Corrie's blog will always put me in a good mood as she's got one of the best humors in the blogging community. So there's the first 'Six Favorites' post wrapped up. I thoroughly enjoyed writing this post and I hope you enjoyed reading this post. Every single one of these ladies is inspirational in their own way and no two blogs are the same at all. Head on over to their blogs by clicking on their names. If you have any blogging recommendations please leave me their links in the description below and let me know what six favorites posts you'd like to see.